The Humble Bundle is a fantastic way to pick up great games for a low price. While it usually favours games on PC, the Humble Mobile Bundle is all about smartphones and tablets. Well, the latest one targets Android exclusively and gives you six top titles for a pay-what-you-want price. Catan: The classic strategy board game, Catan is all about building settlements, connecting them with roads and amassing a massive army to defend and attack. Normally $4 on the Play Store, you can get it far cheaper here. The in-purchases for expansions, however, are not included in the bundle. Vector: iOS has great endless runners 7 Endless Running And Jumping Games You Need On Your Device [iOS] 7 Endless Running And Jumping Games You Need On Your Device [iOS] Two of the more popular gaming genres on iOS are the endless runner and endless jumper game types. In these games, you are tasked with moving either forward or up through a level and attempt... Read More , but Android isn’t far behind. Vector is a cool runner where you have to perform parkour stunts to gain more points while trying not to get blocked by obstructions in your path. Normally costs a buck on the Play Store. Riptide GP2: Riptide GP is one of the best racing games you will ever play Race To Your Smartphone Or Tablet's Limits With Riptide GP [Android & iOS] Race To Your Smartphone Or Tablet's Limits With Riptide GP [Android & iOS] Riptide GP shows just how much graphical power modern smartphones and tablets have. This game offers more than just great graphics, however – there’s a great racing game here. It even uses realistic water physics... Read More . It’s sequel is even better! Riptide GP2 puts you on a jet ski and into one of the most high-octane, adrenaline-filled joyrides of your life. Fast, fun and feature-packed, it usually would set you back by $3. Zombie Gunship: Most games make you take on zombies with a gun, trying to hide from them and survive as long as possible. Zombie Gunship puts you in an air carrier and gives you heavy artillery to take out the undead on the ground. Super satisfying and you won’t even have to pay the full dollar it asks for. Badland Premium: Badland is among the coolest atmospheric platformers, making it to our list of the Best iPad Apps. Sure, the game is a free download on the Play Store. But the big deal here is that all the in-app purchases are unlocked for free if you buy it through the Humble Mobile Bundle 4 offer! Breach & Clear: You would think tactical combat shouldn’t be compressed to a small mobile screen, but playing Breach & Clear will change your mind. Not only do you get it for free instead of the $4 price tag, you also get all the in-app purchases unlocked with it. 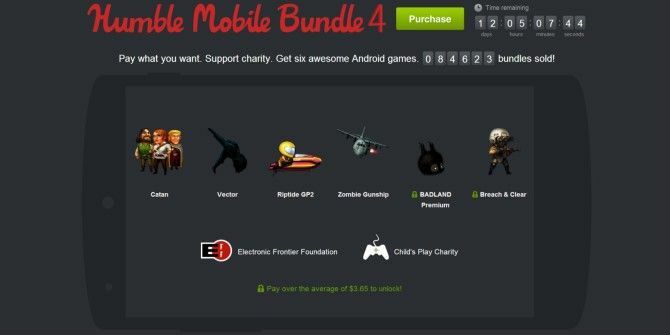 The Humble Mobile Bundle is a great way to track down cheap games on Android Finding Cheap Apps: How to Track Down Deals on Android Apps and Games Finding Cheap Apps: How to Track Down Deals on Android Apps and Games There are easy ways to find the latest and greatest apps and games on sale, monitor apps you want to buy for price drops, and get free apps every day. Read More , so don’t miss out on this! Offer’s on until Tuesday, March 18 at 11am Pacific Standard Time.